At Motion State we offer a wide variety of options for your pursuit style filmmaking needs. 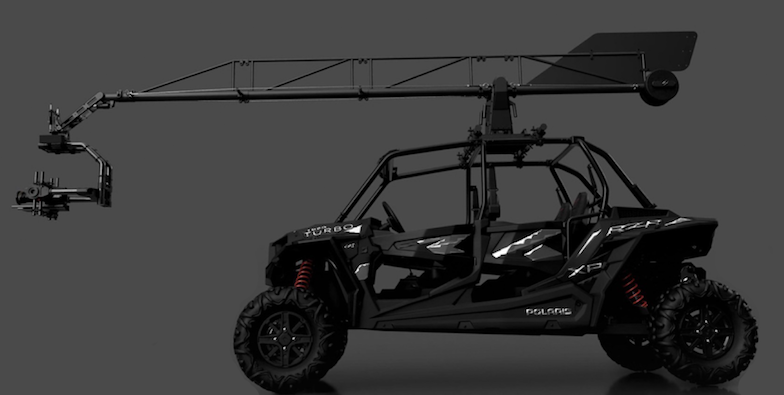 From traditional “Russian arm” style camera car rigs to customized RC cars capable of chasing NFL athletes, we have a system or solution to fit even the most demanding situations. Our years of experience in the stabilized camera platform world has allowed us to create some pretty amazing pursuit system packages. Our packages all have the ability to travel just about anywhere in the world as checked luggage. We offer all the equipment, technicians, camera operators and drivers for all our systems. We are local 600, fully insured and true industry professionals. Our Flowcine Black Arm pursuit packages have been custom designed to highly portable systems capable of executing pursuit style shooting anywhere in the world. Utilizing the Flowcine Black Arm 3 axis stabilizer along with one of our Freefly Systems Gimbals we can custom tailor a price effective package for any stabilized tracking and pursuit production needs. Best of all the framework for all our systems is based off industry standard speed rail and can be rigged and modified extremely easy. From our BMW X5M and Polaris RZR packages to our super travel friendly global system we are ready to strike anywhere in the world. The BMW X5M Black Arm Pursuit package is our high speed pursuit beast. 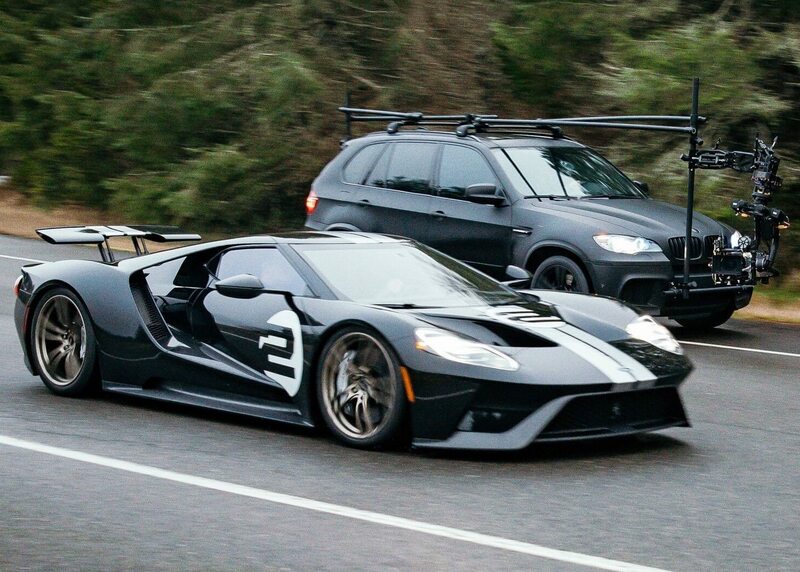 With 500 horsepower, this system is capable of speeds above 100 mph for even the most demanding pursuit needs. Our package includes our matte black wrapped BMW X5M with qualified precision driver, Flowcine Black Arm gimbal stabilizer and choice of stabilized head. The interior has been decked out with 2 x 7” Small HD Monitors in the back seat for your 1st AC and director as well as 7” Small HD Monitor upfront for the camera head operator. As well as monitoring we have a full 4 seat wireless comms system to keep the whole crew in sync. On the outside, the Flowcine Black Arm Gimbal stabilizer can be adjusted in minutes to adjust height and be either front or rear mounted at heights of 6” to 6’ off the ground. Our entire system is road legal and comes equipped with a GMC 2500HD Truck and Trailer to bring it anywhere in the country you may need. We are fully licensed and insured and ready to take on whatever your pursuit needs may be. Similar to our X5M package, the Black Arm off road package is ready to get down and dirty and leave the paved roads behind. Equipped on a 1000cc 4 Seat Polaris RZR platform, this system can take on even the most remote and treacherous locales. Our off road system is configured with speed rail both front and rear to easily mount the Flowcine Black arm and stabilized head of choice. The system package works great with all our stabilized heads like the Freefly MOVI XL, MOVI PRO and MOVI Carbon. We have 2 x 7” monitors mounted in back seats as well as 1 x 7” upfront for the camera operator. Like our on road pursuit system we have the ability to trailer the whole system to anywhere in the USA. Need a stabilized head solution on the water, well we have the answer. 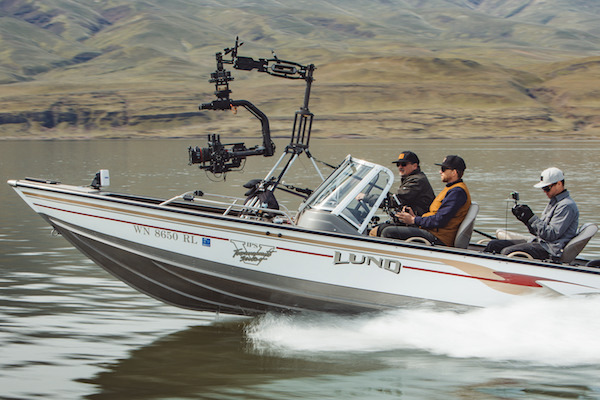 With a wide array of mounting techniques, we can rig up our Flowcine Black Arm to just about any vessel out there in no time at all. From tracking Wakeboarders, to boat to boat running footage or you just need a killer shot of wildlife, at Motion State we have you covered. Take your pick of stabilized heads, from the MOVI XL for large format packages, to simple and effective MOVI Pro or go with the new MOVI Carbon with its 240mm range from capture intimate details with wildlife. Need a completely silent way solution for your tracking shots or just a nimble way to move the camera well we have you covered. Introducing the landshark. Capable of speeds up to 35 mph, off road capable and a run time of up to 2 hrs. Because of its small size The LandShark off-road electric motorbike is capable of weaving in and out of the tightest terrain and able to go where no other pursuit system can. Coupled with the MOVI Pro or MOVI Carbon and the Flowcine Black Arm, this has become one of our favorite toys at Motion State. 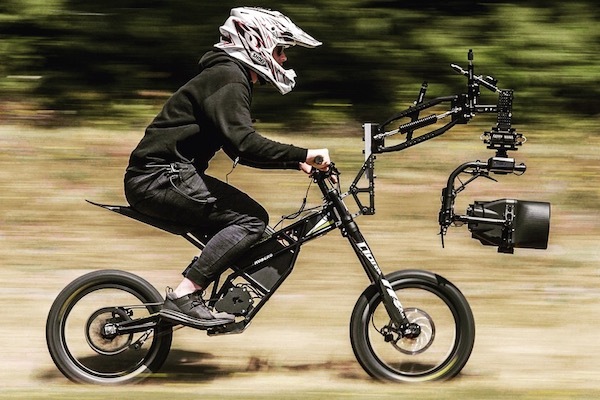 The landshark is a capable of allowing the moto bike rider with camera package to concentrate on navigation while the camera operator stays back with DP or Director to control the gimbal wirelessly over 2.4 ghz and 5.8 ghz bands up to 2000 feet. For and added amount of freedom we can add on a trailer to the package for the bike and operator to have unlimited range and freedom! The Freefly Tero is a super-compact RC car – scale 1/5 about 30″ long and just 20″ wide capable of carrying 3-axis stabilized camera systems. This RC platform has been designed with a custom made vibration stabilization platform for the ultimate in low angle tracking technology. The Tero is capable of traveling at speeds up to 35 mph and works great on both smooth and rough terrain. 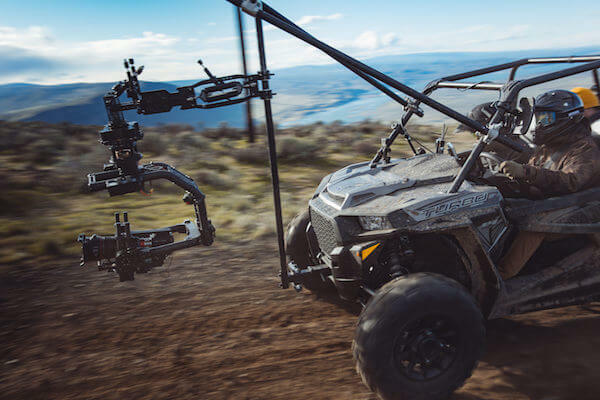 Coupled with the MOVI Pro and your Favorite Cinema Package or the new Freefly MOVI Carbon with its incredible 5 axis stabilized 40-240mm zoom range, we think the Freefly Tero will bring a whole new dimension and creativity to your production. We have partnered with our friends at RennKamera in Seattle to offer the Motocrane Ultra. The most versatile and portable remote arm in the world. Built to take a beating, it has the capability to mount to literally any vehicle you can think of, trucks, cars, utv’s, boats, you name it, we can mount it up. Weighing in at only 190 lbs (390 lbs full weighted) the whole system can travel as checked luggage. The arm length is 12 feet, has 360 pan and capable of carrying up to 55 lbs payloads. The Motocrane Ultra comes with professional grade Dual Stick Arm console for precision operation of swing and lift axes. 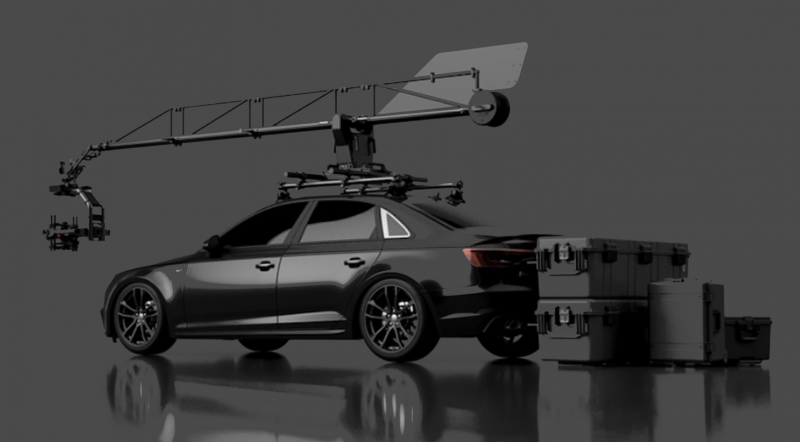 The Ultra can easily accommodation the Freefly MOVI XL, MOVI Pro, MOVI Carbon, Shotover G1 and Ronin 2 stabilized heads. Save money and time with other “Russian Arm” style systems with our competitive pricing, scalable crews and the ability to travel worldwide with this incredible package. The Motocrane is ready to travel anywhere in the world at anytime. Utilizing standard speed rail attachments, the Ultra can be mounted to virtually any vehicle platform. From rental cars, to UTV’s and Boats, the Ultra is ready for whatever you production can throw at us. With a travel weight of 190 lbs split across multiple cases we can easily travel with Ultra as checked luggage. Along with the Ultra we can travel with our stabilized heads, cameras and lenses to any location in the world to offer fully turn key pursuit system anywhere in the world.